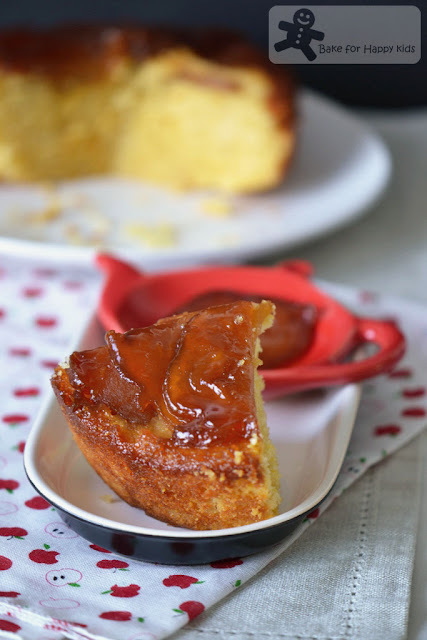 This apple cornmeal upside down cake is very delicious! It is extremely comforting to eat after a nice warming dinner in a chilly night. This cake recipe is from the book, Bon Appetit by Barbara Fairchild and there is a slightly similar version from Epicurious. The Epicurious one uses boiling water but the Bon Appetit one don't. The recipe that I've baked is the book version and I wonder if there is any difference in the cakes baked with the Epicurious version. To me, everything seems to be so well-balanced in this recipe that I've used. The sweetness of apples is well balanced with the saltiness of the cornmeal cake. As the apples were cooked slightly in a thinner kind of caramel, the sweetness of the apples is not overly powered, being just right to create a perfect balance in taste. I'm very happy baking this cake along with my baking buddies, Joyce from Kitchen Flavours and Lena from Frozen wings. Besides enjoying a delicious slice of cake, I was enjoying too cutting the apples into the "apple" shapes and eating an extra couple slices of nicely cut caramel apples which were reserved for my "personal consumption". Admiring a slice of my cake...Yum! my personal stash - an extra slice of my caramel apples... LOL! Preheat oven to 350°F (or 160°C fan forced). Generously spray 9-inch-diameter cake pan with 2-inch-high sides with nonstick spray. Melt 2 tbsp butter in heavy large skillet over medium-high heat. Add 1/2 cup sugar and stir until sugar melts and turn golden brown, about 3 min. Add apples and saute over medium heat until apples are just tender and coated with caramel, shaking pan occasionally, about 12 min. 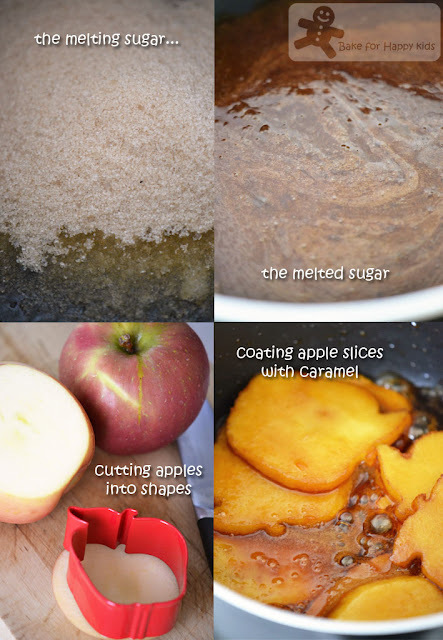 Immediately pour mixture into prepared pan; distribute apples and caramel evenly over bottom of pan. Whisk flour, cornmeal, baking soda (or baking powder) and salt in medium bowl. Using an electric mixer, beat remaining 6 tbsp butter and 2/3 cup sugar in a large bowl until fluffy. Beat in egg. Add half of flour mixture; stir in buttermilk. Add remaining flour mixture and mix well. Drop batter by spoonful evenly over apples and spread gently with offset spatula. Bake until cake is golden brown and tester inserted into center comes out clean, about 40 min. Cool cake in pan on rack for 5 min. Cut around pan sides to loosen cake. Place platter over pan. Using oven mitts or pot holders as aid, firmly grasp pan and platter together and turn over. Gently life pan off cake. Serve warm. Note: Using half of the recipe, I've baked this cake in a 12 cm round cake pan at 160°C fan forced for 40 min. I hope you have wonderful travels! Hmmm, another beautiful recipe. 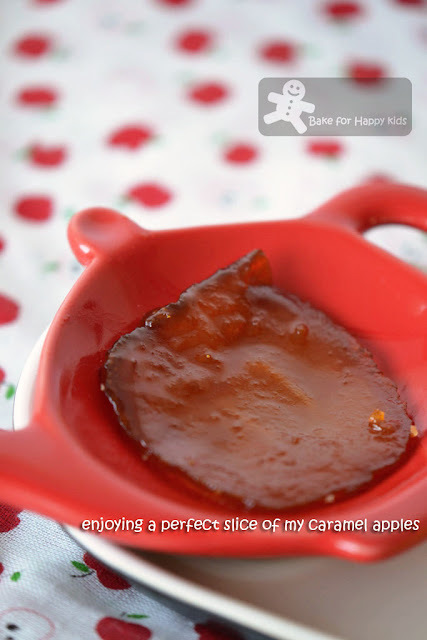 I like the caramelised apple slices! Going for holidays again? This looks amazing and I like the way your cut out the apples. Lovely presentation! 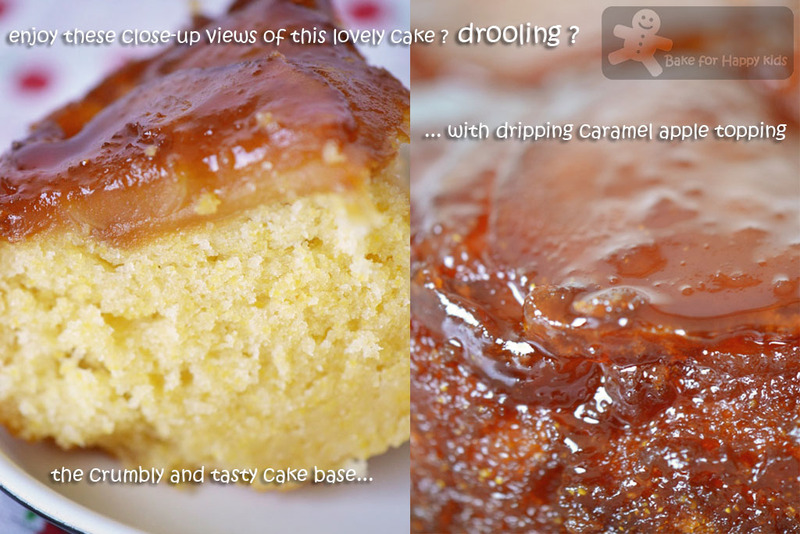 Zoe, this upside down cake look and sound amazing. I made it before with peaches, but I can imagine how tasty must be with apples too. Have a wonderful and safe trip!!! Your cake looks so lovely with the apple shaped apples:D Gorgeous color! Your apples are in the shape of an apple! I really love the shape.Did you use a cookie cutter? Your cake looks so rich and beautiful! I think I would eat too many of those caramel apples and not have enough leftover for the cake! The cake looks awesome! i hv some awards for u, do check it out ya! Your apple slicer is SUPER cute. Love the presentation. At my place also we loved this cake. Very delicious. I just came by from Jeannie's and Lena's and I simply cannot resist this cake! hey Zoeee.... I cant find words to say how this cake is looking irresistible. This is looking better than a pineapple upside down cake :-o By the way, i love your photographs too...Would you mind telling me which camera you are using? The camera that I'm using is Nikon D3100. This cake looks gorgeous! I have never made an upside down cake. It seemed really hard to make. But with this step by step, I shouldn't worry! Your apple cake creation looks awesome! Caramel apples with cake. Definitely great combination. Too bad I don't have any cornmeal so have to skip this time bake-along. Have a nice travel trip ahead! The cake looks so tender! The apples look delicious, too (I love anything with fruit and caramel). Beautiful! i just read the comments from those who have baked the cake from the internet, it seems that theirs turn out just as good. I got to chk theirs out after this. It's a delicious cake, good choice! You gals sure know how to pick delicious looking and I am sure, yummy tasting cakes. I do want to make this one. I am a big cornmeal fan and find it goes well with sweets. What an adorable apple slicer! My goodness. I love caramel apple cake. This looks like a winner. 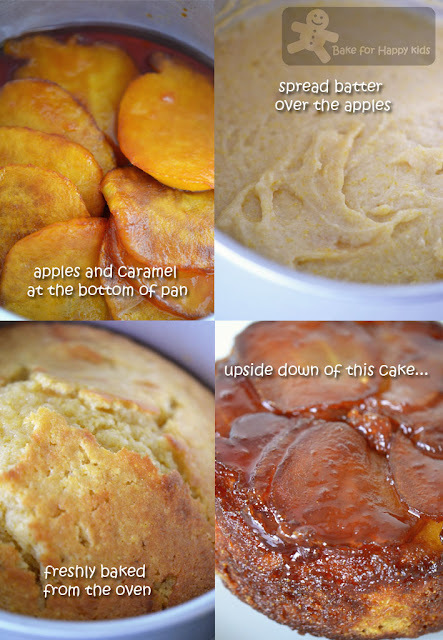 How cute how you cut the apples...like the idea of using cornmeal for this upside down cake...would love to have a slice of this cake right now. OMG Zoe! This is GORGEOUS!! What a fun and yummy treat!! I love baked goods with cornmeal in them too, it adds such a new dimension to it. Great recipe! Oh this cake looks so delicious!! I always wonder about different versions of the same recipe. It looks sinfully delicious to me. I had some extra caramel apple slices left to snack on while waiting for the cake to bake too. :D Your photos are so good! Looks like a recipe that I really have to try! So yummy! Yumms! and I want that cute cutter! Great pick:) I'm trying to bake mine tomorrow as it's a public holiday in Spore. Love your apples cut out from your lovely cookies cutter. Mindblowing, such an irresistible cake. Does 1 stick butter mean 250g? 1 stick of butter is 113g. 1 cup of butter is 250g.